On the 22nd of February, Minds In Action came to MYO to teach our Grade 7, 8 and alumni group about robotics. 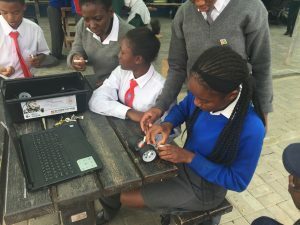 The Minds In Action STEM (Science, Technology, Engineering and Mathematics) Program aims to offer Namibian students an opportunity to learn about robotics and how to apply this knowledge in their contexts. During the Demo, science and maths concepts were combined with technology and engineering principles through the process of building and programming Lego Mindstorms EV3 robots. Our learners loved it!